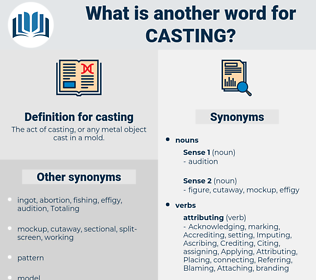 What is another word for casting? 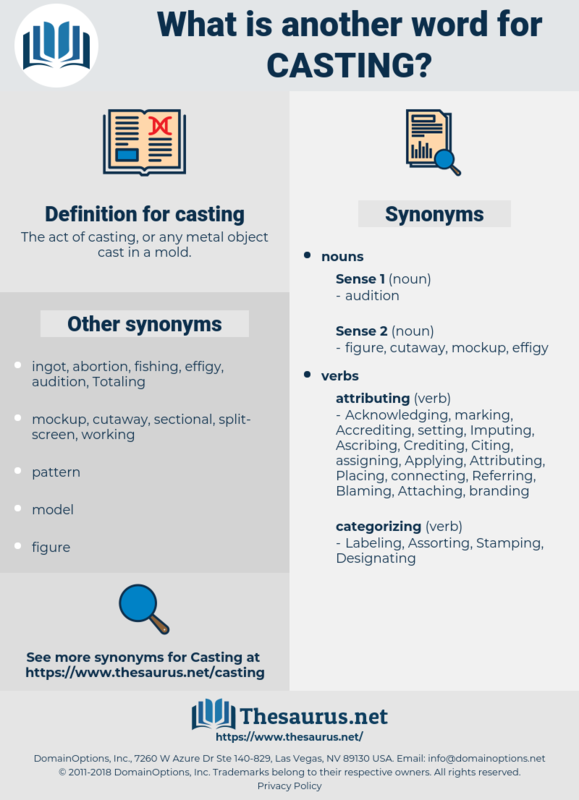 The act of casting, or any metal object cast in a mold. dive, molding, emptying, sharing, colada, allocation, melting, distribution, apportionment, splitting, turning, massallocation. Testifying, Articulating, apportioning, investing, causing, Discarding, featuring, registered, Registering, setting, issuing, calling, applicant, decisions, showcasing, Stipulating, Creating, Disallowing, Rejecting, voicing, stirring, tossing, Deposited, Depositing, Expressing, triggering, determining, Arousing, sparking, conducting, deciding, decides, Stating, projecting, Dismissing, Placing, tapping, recording, Embarking, Delivering, Adjourning, sending, Surrendering, erecting, Submitting, provoking, leaving, reflecting, Consigning, Establishing, Possessing, pitching, benefiting, passing, Commenting, Disposing, Preparing, Signalling, arranging, Enjoying, designing, prepping, rendering, Tabling, conveying, focusing, focussing, slipping, Adopting, enabling, dividing, filing, grinding, laying, leading, raising, prompting, Allowing, putting, Waiving, bring, bringing, taking, Lifting, Fanning, hurling, Evoking, driving, planning, fueling, yielding, pouring, lodging, Flipping, looking, ruling, giving, mapping, Hiring, Permitting, building, emitting, dumping, Plunging, offering, dropping, letting, Having, junking, shedding, sharing, melting, turning. As we were casting off, Monsieur Gratiot called to us that he would take the first occasion to send our horses back to Kentucky.
" Yes," said the young man, casting a glance over himself; " I am compelled to admit that it is rather becoming. surf casting, bait casting, fly casting, surf fishing, overcast. engine block, block, cylinder block, life mask, death mask. selection, choice, pick, option, fishing, sportfishing.